Everything which has been added to EPCOT post around 1984, when the enchanting Morocco pavillion opened, has been a significant departure from the EPCOT Center model in ways variously subtle and overt. Morocco is an unusual case in that it actually betrays the hand of a later generation of Imagineers - those who built Animal Kingdom - with its earthy intensity, preoccupation with native craftsmanship, and apparent interior organic disorientation. It is the 1988 additions which are more difficult to classify, as they cover a diverse aesthetic rang e. Of the three The Living Seas pavillion is perhaps the easiest to classify as essentially “EPCOT”, at least at a passing glance. But The Living Seas betrays a larger conceptual logic which is not part of the EPCOT tradition at all – the immersive environment. Although it’s very hard to fault the pavilion for its bold evocation of bringing guests to an undersea base through “Hydrolators”, then back to surface with the same, it actually disguises a very traditional themed show in a classic EPCOT-style building. Even the entrance area, with its’ carpeted switchbacks passing marine artifacts and then through a theater where a tedious film is presented, is classical Presentationalism in form before switching gears into science-fantastic Narrative. What is ironic is that this pavilion proves that the balance can be struck: The Living Seas fit right into EPCOT’s 1983 components without actually engaging in the same level of non-narrative discourse, resolving itself in the comforting environs of the traditional theme show. Wonders of Life is an even greater conundrum. The mode of the pavilion is not the traditional EPCOT mold of white, perfect, angular structures but outside and inside a rather diverse, cartoony, distinctly 80’s shopping mall-type atmosphere which one feels was never fashionable. Yet ironically Wonders of Life does not cheat it’s environs, eschewing the traditional theme show mold and coming close to Presentationalism in its’ open air dome which makes itself out to be nothing less than a big pavilion full of entertaining information, in the grand old EPCOT fashion. What makes Wonders of Life sometimes rather difficult to swallow is its’ wholesale endorsement of a rather jokey 1988 version of “futurism”, where recognizable television celebrities loom from all darkened corners and it’s just as important to us that Body Wars was directed by Leonard Nimoy with effects by the same folks who gave us Star Wars (a connection the title exploits) that it is that it’s a supposedly educational tour through the human body. There is much of the original EPCOT charm evident in Cranium Command, probably attributable to the fact that a number of Disney old-guard WED staff worked on it, including X. Atencio, which gives it a classical feeling. Combined with a smart script which doesn’t make mince meat of its’ silly premise and strong animation and direction by Gary Trousdale, who would go on to co-direct at least two masterpieces of Disney’s “second age” of animation (Beauty & the Beast and Hunchback of Notre Dame), the attraction has a classical atmosphere which overcomes its’ dated lighting, performers and ‘contemporary’ filmed sequences. It’s really the only wonder in an otherwise stale pavilion. 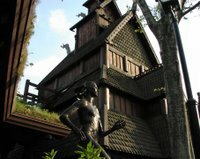 The World Showcase Norway pavilion is a classier act, adding to the World Showcase formula of nice shops and a decent sit-down meal establishment a boat ride through mythology and fantasy. Malestrom is actually closer to the presentational form than it is the narrative form as it uses a succession of stylized spaces placed in disjunctive patterns. Although ‘troll magic’ is used as a narrative device to move the disjunctions and dislocations along, this actually serves the presentational purpose of being able to include a number of geographically disparate conceptual images in a flow which is logical but hardly possible. The attraction furthermore skews the balance towards the traditional EPCOT formula through the use of a narrator / interpreter throughout. But the strongest connection to presentational attractions like World of Motion is the queue, which takes place in nowhere – a strange zone of turquoise walls with modernist blonde wood accents adorned with clusters of Norwegian flags. Finally the boats are seen passing along in front of a huge mural which depicts things which will be seen in the attraction itself. This is Presentationalism in a pure form, bringing the narrative flow all the way back to the Fantasyland dark rides of 1955. The rest of the attraction plays in modernist Narrative forms, especially a flume ride, but the classical EPCOT form is there in spirit if not tonality. 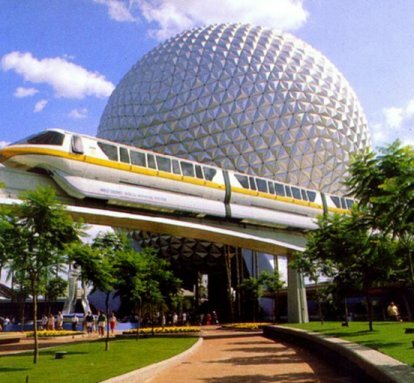 These transitional attractions convey the general confusion at the time about EPCOT, how and why it reaches audiences, and how to proceed with “plussing” the park without dissolving that essential tissue of EPCOT Center. That The Living Seas, Wonders of Life and Norway integrate so totally is a tribute to the excellence and malleability of the EPCOT theme show more than the designers already attempting to cast EPCOT in their own form. Sometime in the early 90’s, perhaps in a fit of exasperation, Disney park management finally decided on what EPCOT was: a Discovery park – never mind that that term leads you to expect something like a Sea World. Since a “theme park” could only be, in the minds of park management and guests, a Magic Kingdom-style experience, and since EPCOT was definitely not, a new terminology must be invented. 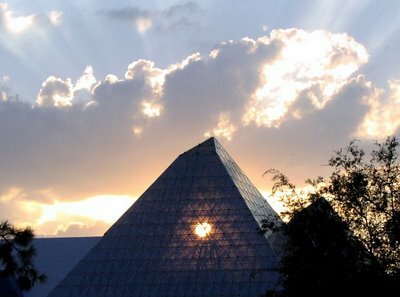 Under the guise of a “discovery park” the four enormous conceptual hearts of EPCOT Center were gutted – CommuniCore, Horizons, World of Motion and Journey Into Imagination – and replaced with watered down versions or only tangentially related thrill rides. Test Track, the biggest and most inadmissible blemish, also straddles the line between the traditional narrative show and the traditional EPCOT presentation, with the balance skewed towards the narrative in its’ effort to fully reconstruct an automotive test facility, less so a stylized representation of one inside an EPCOT Center pavilion. But this concept was one evaluated by the designers of the original World of Motion and rejected, and its’ not hard to see why – WDI’s version of a test facility has to strain the line between a stylized fantasy version of a test track and an authentic one. The inharmonious balance is evident in the contrast between the happy plywood environment of the “Mountain Road” hairpin turns segment and the ugly industrial buildings seen behind the pavilion, truthfully the EPCOT support facility but convincing as GM automotive support buildings because – let’s face it – bad show all looks the same. Test Track’s interior is telling – neither especially badly themed nor especially appealing – the reason it appears to have been rejected in the first place, by an older and, yes, wiser team of designers. What Test Track has is a lot of clutter. This is not inaccurate for a test facility, but when WDI designed this pavilion it seems like somebody came along, rubber stamped it “A-OK”, and WDI immediately decided that this is what EPCOT was – clutter. Communicore is now cluttered with strange awnings, neon lights and other valueless paraphernalia. 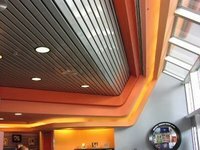 And this is what WDI has been doing for years now – covering up EPCOT Center’s beautiful, sleek, simple lines, shapes, colors, and forms with clutter which in content and color is not dissimilar than their concurrent redesign of Magic Kingdom’s Tomorrowland. This in concept is not dissimilar – both areas were large, white and sleek, monolithic gardens of futurism, a concept which is dating badly now that we’re actually entering the 21st Century without a flying car in sight. It is telling that fixing EPCOT involved cluttering it with stuff to make it look more “lived in”, more like a bustling metropolis. What WDI is actually doing is slowly recasting the EPCOT aesthetic in a new mold which seeks to reduce the monolithic lines, huge open spaces and serious atmosphere of contemplation and exploration. Everywhere kinetic devices and colorful distractions whirl and turn and loom and dance and play music in an effort to stimulate the pleasure center synapses, not the intellectual response the buildings are actually designed to evoke. Even the classy exterior of Paul Pressler’s Mission: SPACE pavilion is more intended to evoke excitement and use up extra digital camera space than the more abstract horizon-line / gemstone of Horizons, which it replaced. It may integrate with EPCOT aesthetically but, like The Living Seas and Wonders of Life before it, Mission: SPACE doesn’t know what it’s doing here in this strange park full of so much serious information. Ironically in recent additions the concept of the Presentational form has been gaining new ground. Mission: SPACE has a convoluted rationale behind why it’s budget cuts don’t allow you to travel back from Mars once you get there, but in the way of presenting a Narrative form which cannot resolve itself it dabbles in the Presentational form once again: you never went to Mars in the first place, we were just showing you our nifty centrifuge – silly tourists! Strongest of all in the EPCOT tradition is Soarin’ – a flatly Presentational film dressed up with some sensory gags (not dissimilar, after all, from similar gags once found in Horizons) which does not make any effort to account for hard cuts in the film itself, allowing music and image alone to carry the flow. Like Mission: SPACE, it makes no effort to disguise the actual workings of the attraction. But it fits squarely in the EPCOT Center tradition of interesting, scenic films presented in novel ways and unusual formats. Ultimately as much as WDI tries to minimize the bold but simple lines of Future World (World Showcase is more traditional in design and so is relatively safe from the demolition sphere), not only does the simple but classical design of the structures themselves become ironically more appealing, but also more obvious to the casual viewer, whom is prone to screen out the brick-a-brak in the foreground and see what WDI is trying to hide in plain sight ever more clearly. And ironically, WDI is waging a war which the original EPCOT Center designers themselves waged and lost: how to hide the massive American Adventure show building with a structure that’s actually appealing. They ended up reversing the forced perspective trick utilized everywhere else in World Showcase and cheating the building “shorter” to make it appear more quaint than it really was. That didn’t work, either. The EPCOT case is really unique in the history of Disney’s attempts to convey meaning through themed design in that it’s the only time they’ve actually tried to undo the aesthetic whole of a park which had nothing wrong with it to begin with. Trying to convert a park which only is half of what it needs to be like California Adventure has commanded much money and attention recently, but EPCOT’s reformation has no actual guiding principals behind it, and no apparent organizing logic. It’s just lots of stuff which is “Not EPCOT” put up everywhere and left up even after the perpetrators have been long gone. But lots of “Not EPCOT” everywhere won’t magically transform EPCOT Center into Disneyland III. If that’s what WDI is after, they’d be better off bulldozing the area and starting from scratch. EPCOT’s design is too strong to be overshadowed by a gaudy bandstand ringed in pink neon. It is frustrating for some and awe-inspiring for others that no matter how hard you try, you can take EPCOT out of 1982, but you can’t take 1982 out of EPCOT. Walt Disney Imagineering doesn’t know what EPCOT is or, rather, WDI can’t quite seem to figure out what WED Enterprises actually did. EPCOT Center, one of the most contested of the jewels in Disney’s crown, has been variously badly mishandled and praised over the years, both by its’ creators and those it was intended to inform and entertain. Disney pundits who walk around with their feet in their mouths often dismiss EPCOT as not being “what Walt wanted”, regardless of the fact that Walt Disney’s final dream was in actuality probably unattainable by anybody except himself. What EPCOT evolved as is actually a remarkably sophisticated contrast to Disney’s Magic Kingdom park concept in and of itself. Whereas the disparate areas of Magic Kingdom-style parks seek to interface with each other in a way which is unique and simultaneously discreet, EPCOT takes the concept of the land entryway / bridge and removes all other elements, filling the spaces in between with “filler” designed to evoke “scope” – rolling lawns, flowers, lakes, trees. The signifying arch of the land entrance becomes a huge building which seeks to allude to the contents of the interior pavilion in a way which harmonizes with the surrounding pastoral landscape and with the other pavilions. 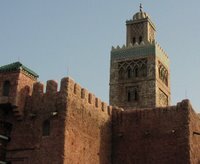 No building has an appearance which is too different than the others, but each building is uniquely thematically unified. The concept of the interior pavilion also makes irrelevant the themed design concepts of unity and harmony across diverse styles and concepts, in the way, for example, The Magic Kingdom matches Caribbean architecture to Southwest architecture. Since the space is totally enclosed (and if not by a ceiling, usually by at least three walls, which is why the World Showcase buildings are all courtyards), there is no actual need to screen out “inorganic” elements! Thus, each pavilion has, once inside, distinct styles, concepts and color tones decided by a unique group of architects, artists, and story men. This approach makes much of the innovation of Disneyland’s lands’ organic blending and thematic orientation actually rather inessential to the EPCOT show: it is a subversion of the codified concept of a “theme park”, made famous by the Disneyland model. What EPCOT does take from Disneyland is the hub and spoke layout and the concept of the “weenie”. But the hub is elaborated into a figure eight, really two “hubs” rotating in a fixed pattern, and the weenie situated on the outermost rim of each: one weenie to guide you into the park, the other to guide you to the back of the park. All other patterns of pedestrian traffic are governed by the circles, either of World Showcase Lagoon or Communicore, mirroring the circle which Spaceship Earth inscribes in the sky. Presentationalism is an aesthetic which has actually been in the Disney canon since 1955, although it is rarely elaborated on or even mentioned in aesthetic overviews of the Disney three-dimensional style, and since EPCOT it has been on the decline, replaced with the elaborate and “depth staged” faux realism which was the mode of Harper Goff’s Adventureland. Presentationalism is the realm of Tomorrowland, simply put, with its’ circle-visions and halls of chemistry, wherein subjects are presented in a rather directly informative way in a way which puts the subject front and center with often a second objective being the direct tactile involvement of the spectator in the manner of a Space Mountain supposedly being about space travel. A classic Disney attraction is often overlooked as one of the great examples of Presentationalism: “it’s a small world.” The representative tableaus within make no effort to accommodate for wildly different architectural styles or geographic locations, all of which are homogenized into large swatches of complimentary colors and vaguely organized into thematic sections. What remains consistent is the deco-style 60’s exuberance of Mary Blair’s colors and shapes, interior scenery by Claude Coates and Rolly Crump, and the song by the Sherman Brothers. EPCOT Center similarly used concepts and abstract connections to thread together its’ attractions, with often very little in the way of a nod towards realism in the way that Disneyland seeks to actually put you in a jungle, in the Old West. Spaces are not designed to be infinite, to recede endlessly into space in the way that very successful themed environments generally appear to do. World of Motion and Horizons marked their space as limited, World of Motion through stock footage projected behind its’ animatronics in a way which is designed to artificially extend the space while also making the audience aware of the methods through which the space is artificially extended. 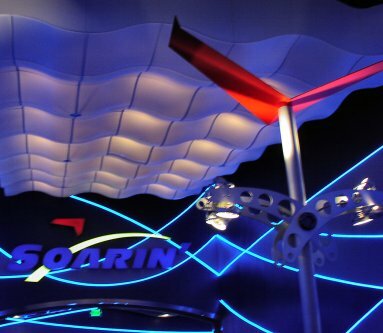 Horizons contained some of the most complex and elaborate sets in any Disney attraction, but broke these up with non-diagetic tableaus or transitional spaces, sometimes as simple as a literal theatrical curtain hung in front of the passengers and lit with diffuse, glowing light. What marks all of the EPCOT Center attractions is the complete abandonment of the articulation of locale: each pavilion locates the visitor not in a pastoral, turn of century Mid- western farm, but a represen- tation of such in a pavilion within EPCOT Center. Even when guests move through a very complex themed space, such as a primordial swamp at the Universe of Energy, eventually the illusion is dispelled through the return to the theatre and the renewal of the filmed presentation. EPCOT Center overflows with film presentations, some innovative, some not, some entertaining, some not (for every Symbiosis there is an Impressions de France, which is still as beautiful and enchanting as it was in 1982). Film is, after all, another method of presentationalism, and what EPCOT’s attractions actually do, through their disjunction of space and time, is force you to locate your momentary existence within the attraction not in a futuristic undersea city, but in the continuity of knowledge and science which informs the human experience – not the moment, the cumulative whole. This function is essentially identical to the function of the documentary film, where the audience is not expected to be caught up in the universe presented, but to learn by example. EPCOT Center evolved not out of the narrative tradition which Disneyland sought to evoke, but out of the documentary tradition of Disney’s Man in Space and other programs. This is why its attractions, shows and exhibits were as revolutionary as its design: it, in the words of Walter Benjamin, both established and abolished its own genre. That’s why there will never be another EPCOT. What the Hell Do You Kids Think You're Doing? During the Christmas break I took the opportunity to re-read John Hench's very interesting Designing Disney, which led me back to Karal Ann Marling's The Architecture of Reassurance, and it has been lo many long years since I have opened that large volume! Marling's book has been attacked in some circles for writing over the heads of the readership (a comment which reflects more poorly on the reader than the author to my mind), and to be sure it is not a perfect or not even necessarily fun book. Marling's central section is somehow without focus and fails to build an argument even if she makes a number of invaluable critical observations along the way about WED Enterprises, "Medallion City" and EPCOT Center. I'm not entirely sure if this chapter in question is an aesthetic overview or a chronological history, and in fulfilling both needs she actually doesn't quite fulfill the requirements of either, but let's be honest folks - The Architecture of Reassurance is an important book. It concludes with three fantastic essays which ought to be re-read by anybody who takes the work of WED Enterprises and WDI seriously, the best of which is an excellent critique on the art of critique itself, called Forty Years of Overstatement by Greil Marcus. I won't reprint even a word of it here such is my admiration for this effort, but as he points out, the theme show has a (fifty year!) head start on anybody attempting any kind of coherent critical analysis - the form has yet to produce a scholar who has written a fully articulated account of it's forms, meaning, values and effects. I believe much of this stagnant critical function comes from the fact that of the significant works on the art form itself - among them Vinyl Leaves and The Architecture of Reassurance - not a single critical scholar has yet to develop a useful vocabulary about what each articulated element in a themed show actually is, in the way that film scholars have been doing for 80 years now. Very little successful discussion of any item, area or psychological effect can actually succeed if there is no word for the item in question to begin with. Furthermore, nobody can build a counter-argument against a false analysis if nobody has pinned it down yet with an interpretation and applicable term. "But as the "doom buggy" winds its' way up into the attic, past the vestigial bride, the scene shifts to a cemetery, outside the Mansion. The terror arises as much from the violation of the dramatic unities, the abrupt turning inside out of the building, as from the graveyard tableau itself... By switching the point of view spasmodically from interior to exterior, however, the movie metaphor is deepened and amplified. Instead of the bookish, linear narrative of Main Street, the Mansion opts for the cinematic jump cut. Continuity and reassurance are first established and then abruptly denied, for an emotional effects that floats free of narrative..."
But the theme show is a much more complex art than that of film, really the next step, and an overabundance of such interpretations actually close off more avenues of approach than they open up. We need a better system to measure success or failure. The problem is that a vocabulary cannot simply be agreed on and them used by everyone all at once, for a useful mode of critical discourse to arise from such discussions one must present arguments which codify into terminologies which can be entered into the public space of common discourse. And outside of terms like weenie, show, environment, atmosphere, setting and others, currently one is adrift in a harbor of smilies: "like the Haunted Mansion", "Pirates-like", "Toad-style" and more. This, I believe, is the biggest hurdle towards developing the theme show into a critiqueable art, with an applicable vocabulary and an established list of representative classics. So in the way of clarity here, and in the way of acknowledging what the hell I'm doing, I'd like to here re-affirm the intent of this blog and to repeat, now that I have an audience, my first post. I would like this blog to be an outlet for my writings on the Disney Parks, their masters, their use of space, design, their successes, their failures, their histories, how they work, how they guide attention, how they relate to film and other media, and all other aspects of this not new but not yet understood art form. And I hope to do justice to them. As an introduction... a quote. pg. 321, Robin Allan, Walt Disney and Europe. Indiana University Press, Bloomington. 1999. 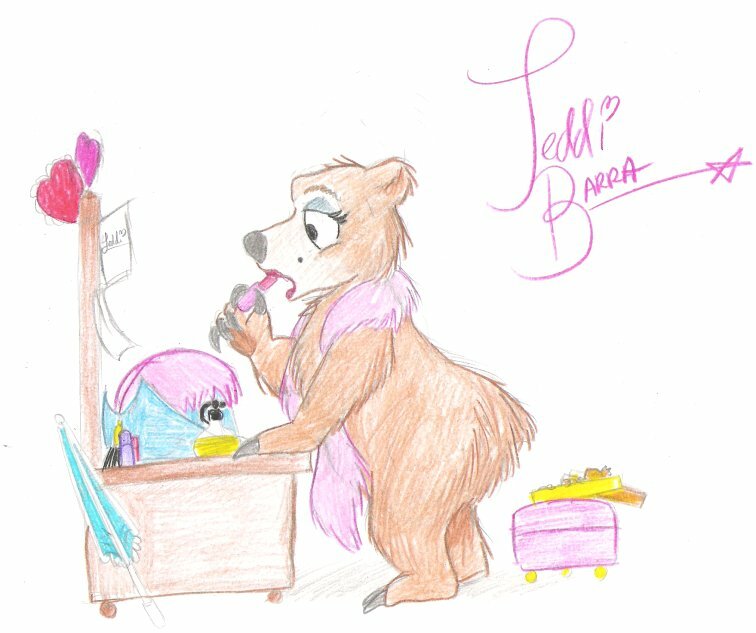 Drew this a bit ago. So why not post it here, anyway? I'm sure you can click for larger view.